Read the reviews for my full colour sword booklets for the collector. The author is well known as a leading sword dealer and authority with some six well-produced books already to his name. 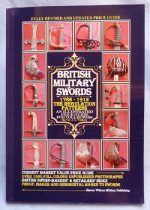 This is a new volume in a projected series of about 15 monographs on individual types of British military sword. This is a welcome venture, rather reminiscent of the Arms and Armour Press monographs from the 1960’s that so many collectors cut their teeth upon and which are still highly rated today. 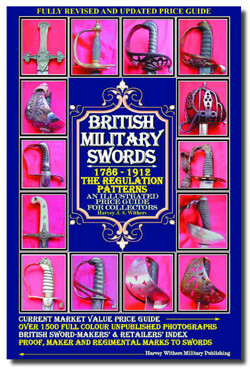 This series will build up into a useful reference work on British military swords and Classic Arms and Militaria wishes Mr Withers every success with his endeavour. Excellent value for money. 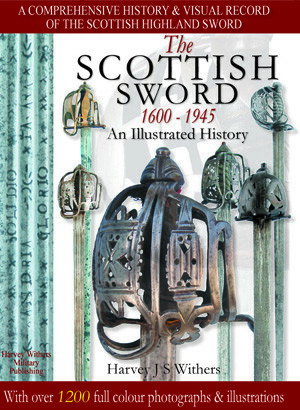 This is number 2 in the series covering the distinctive sword still carried in Highland Regiments to this day. It follows the format of volume 1 with numerous views and illustrations. There are sections on swords marked to individual regiments as well as those swords carried for fighting or undress with the crossbar guard instead of the full basket. A very useful, in-depth study. Volume 3 fills a much-needed gap for those collectors whose passion is for the fighting sword of the lower deck in the Royal Navy. The book starts with non-regulation types that proliferated before the celebrated 1804 Pattern with the figure-of-eight guard. Throughout this period the emphasis was on producing a cheap, robust, no-frills sword for the seaman to use when boarding, repelling boarders of on landing parties. The Royal Navy was never known to lavish much attention on personal arms for the seaman, believing instead that resources were better spent on the ships themselves and their artillery of great guns. The Napoleonic era is illustrated with a nice plate of Henry Angelo’s Cutlass Exercise of 1814. The 19th Century cutlass tended to be very much better made and more sophisticated. The Patterns of 1845/58, 1889 and 1900 are all dealt with in detail. The cutlass bayonets, Patterns 1871 and 1859 are covered; they represent an attempt (only partially successful) to make an effective weapon system for the seaman armed with an Enfield or Martini rifle. An excellent, tightly drawn study. 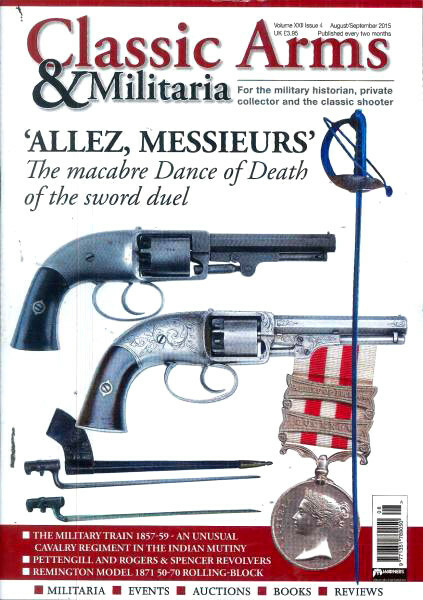 Specially produced for the 20th anniversary year of this militarily and politically important battle, the author deviates slightly from his chosen path of British military swords in volume 4 to include those carried by the French as well. 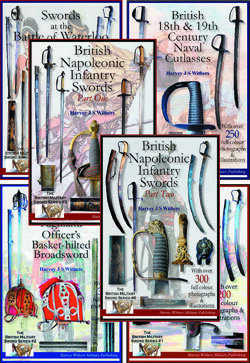 Most of the main types – infantry and cavalry – are depicted in what must be seen as a general book. Nonetheless it is a battle specific guide to what was principally carried by the two main combatant forces.